I love Spain and the food culture there. I lived in Madrid few years ago and I got the chance to travel around. 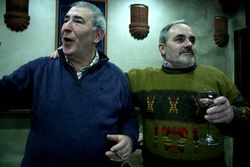 We went to Rioja, it was in December, not quite the tourist season, but it was really nice. No tourists, good food and lots of nice Red wine. We went to Logroño, Laguardia og Haro. I am sure the atmosphere is different during summer and I will visit Rioja again one warm summer day. Our first stop was at a gas station and where else but in Spain can you get a great red wine at a tapas bar in a gas station. I had Callejo, Crianza 2005. That was a good start on a great culinary trip. Logroño was awesome. So many tapas bars, door to door. We met 2 older local guys and they took us all over town to great bars that served brilliant tapas. 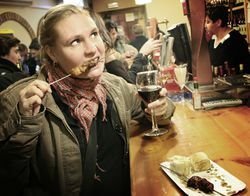 Culinary highlight: Bar that sells nothing but wine and grilled meat on a stick. Cultural highlight: An old man sat in the corner. He looked lonely. When we got in our 2 friends started singing Flamengo, The old man in the corner lit up, he came over and started singing as wel. He sang like an coir boy. what a voice!! Started singing like an angel! And that´s me and the singer that surprised me! great story and great portraits of what looks & sounds like a great evening! Seems like you had fun! 😉 Good post!